Obviously, the script is not perfect; it has some padding issues, and it's missing a lot of icons that I'd like to eventually add (still haven't figured out how I'm going to represent HTML/CSS without using the HTML5/CSS3 logos). It could also probably eventually be adapted to work on lots of Stack Exchange sites, not just Stack Overflow. Easiest way to install it is with Tampermonkey on Chrome/Opera/etc. Just click the Tampermonkey icon, click "Add a new script...", and paste in the code. It ought to work just as well in Firefox/etc since it's just a Greasemonkey script, but I haven't tested it. 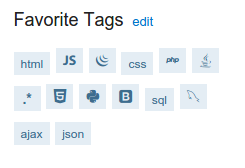 // should the icons apply everywhere tags appear, or just for favorite tags? 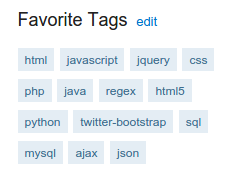 DISCLAIMER: don't try to edit your list of favorite tags while this script is enabled; you'll end up losing them. Browse other questions tagged script tags tampermonkey . Collapse interesting and ignored tags sections!